Modern fabrics for any project. 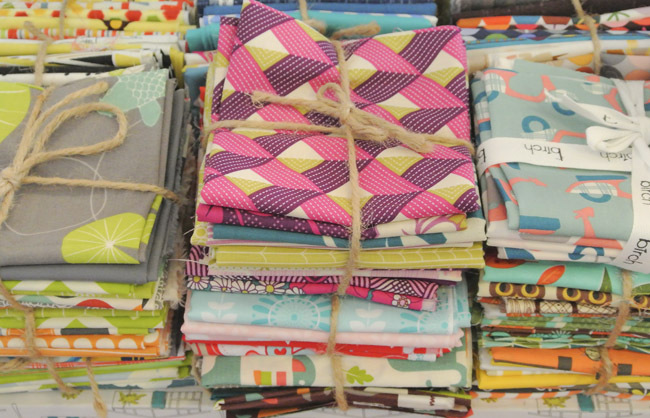 Their fabric supply focuses on distinctive fabric for home decorating, garments, kids, and quilting. Their wide range of current designers include Alexander Henry, Moda Fabric, Timeless Treasures, Michael Miller & more. Weekly Sales. You can get details by checking their blog, signing up for their newsletter, or liking them on facebook. Tutorials & Free Patterns. The blog also features great quilting tutorials, sewing projects, and even some free patterns. Their focus is to help beginner sewists and encourage the use of modern fabrics. Left: Andrea, Marketing & Graphic Design. 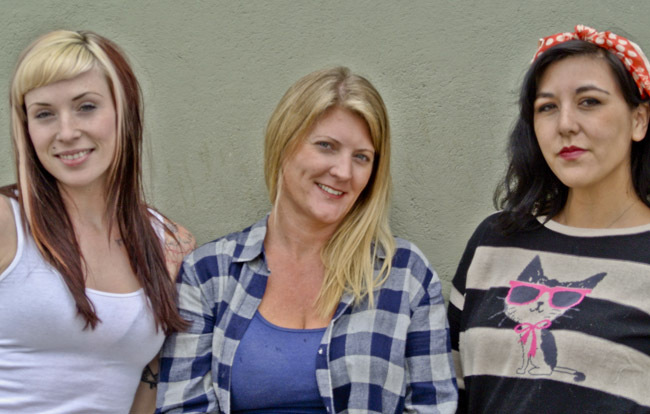 Center: Cynthia, Owner. Right: Arleen, Birch Wholesale Manager. Birch Fabrics Organic recently partnered with Charley Harper to create a new collection in 4 different textiles: cotton poplin, knit, flannel, and canvas. For this giveaway, Cynthia is allowing 1 winner to pick 5 yards from any fabric in the new collection. Why you are excited about the new Birch Fabrics’ Charley Harper collection. What you would do with 5 yards if you win. ETA: Congrats to Maxine, who won the 5 yards of fabric! Fabric Finds: Find fabrics by color at More Cloth! I LOVE Charley Harper and was looking forward to this collection for a long time (Fabric Worm kept teasing before they actually got it). I haven’t bought anything from it yet, but 5 yards would be incredible. Definitely a dress! Wow : fabulous prints in organic KNITS!! I’m in! I find it very hard to find patterned knits locally, moreover organic fabrics… I sometimes wish I lived not is an ancient and dying fashion mecca ; Montreal used to be a huge textile industry center. I love that the prints are gender neutral and still adorable. With 5 yards of fabric I could force my family to wear matchy matchy pjs! This collection is absolutely fantastic! I’ve always adored Charley Harper’s wee lovely birds and it’s so exciting to have them translated to fabric. 5 yards of a flannel would make the perfect casually festive dress for winter! 1. Those are completely adorable prints! 2. I’ll be making a poufy dress from a vintage-inspired pattern. I’ll also have enough left to make a pinafore for my toddler. That Charley Harper material is amazing! I’ve been a fan of his work for ages, and I would envision sewing a snuggly quilt with the flannel version. Perfect for burrowing! I love Charley Harper’s designs. I have been waiting for the canvas to become available. My grandmother loves cardinals, and I’ve been wanting to make a cushion for her window seat. First, the next time I go to San Fran, I am going to stop by this store! eeek! I love this collection. I think they followed their mission perfectly, their fabrics are whimsical. It describes this collection perfectly. I’m sure that it will continue to describe their future collection as well. I would love to try to sew with poplin as I am a cotton lover and I’ve never sewn with poplin before. I love the Charley Harper aesthetic!! With 5 yards…oooo, definitely a knit dress – perhaps a lady skater – and maybe some cozy pj pants!! I love how whimsical Charley Harper’s designs are! A quilt would be amazing, or some wonderfully comfy winter pjs. There are so many delightful possibilities! First, I just wanted to say that Fabricworm is my go to online fabric store (living in a place where Joann is my only option) and they are wonderful – amazing selection, great customer service, and lots of sweet promotions. As for Charley Harper fabric, it’s really just a match made in heaven, isn’t it? I’d use the giveaway to get fabric for the play tent I plan to make my two year old son for Christmas, hopefully with some pj pants and/floor pillows thrown in too. Thanks for a wonderful giveaway! Oh god, I’ve been in love with that cardinal print ever since I first saw it what feels like ages ago. Five yards of the knit would make me a dress and a shirt. Five yards of the woven would probably be made into the dress for the new Flirty Day Dress class on Craftsy. I have loved Charlie Harper for a long time, and have been waiting for these to come out! Boy, I have lots of plans for this fabric- pj’s for my boys, some t-shirts, and some home dec work with the canvas. Thanks for the awesome giveaway! I like that there is a variety in fabric types– but how to decide which one to use???!!!? I also like that Charley Harper’s illustrations are nature inspired. A dress. With 5 yards definitely a beautiful wintery dress. We are big Harper fans at our house. I love the integration of modern and organic aesthetic. Spare and minimal but connected to the elements that sustain us. I have these prints on my wish list. I’d fashion curtains, throws, or maybe a dress for my girls. My sewing buddy and I have been dying over this Charlie Harper fabric, so I’d have to split it with her! I’d love to make some flannel pjs for my kids (and myself!). 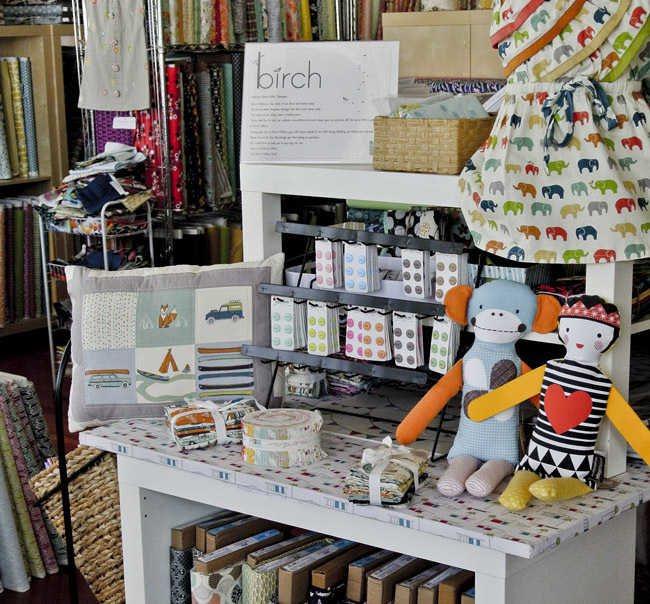 Big love for fabric worm and birch! I love how they look vintage, but modern at the same time. I love the simple, beautiful designs! If I had 5 yards, I’d probably make my daughter and me matching skirts or dresses! I have a deep love for Charley Harper’s work, and literally squealed when I heard about the fabric! 5 yards would make an amazing dress to wear for years and years! I adore the Charley Harper collection, especially the cardinal visual element. This is a cool collection without being too precious. With 5 yards, I would make 2 dresses and a couple throw pillows for the living room sofa. I’ve never tried birch organics fabric but if I won I’d definately make some shirts for myself and use the scraps in quilting! I haven’t heard of Charley Harper until now so thanks for sharing! I love these prints! So colorful and modern yet vintage looking! I would make a dress or a top and curtains! or maybe xmas gifts! 5 yards is a lot! I would be thrilled to win!! I think the prints are beautiful! If I had fabric, I would try my hand at making my daughter some clothing – if I thought that would be a bit too ambitious, however, I’d probably settle for something more do-able (for me), and make some throw cushions for the playroom. Awesome fabrics! The lines are so clean and fresh. Not sure if I would make a dress or skirt, but 5 yards would definitely be divine! I adore Charley Harper’s bird prints! With 5 yards, I’d make a dress or two for sure. I LOVE birds, and this modern take is my favorite. I have been obsessed with making tote bags and if I won 5 yards, I would have the best bags this coming season. Oh I love these prints!!!!!!!! I am not much one for prints but these?! These I love!!! I would love to make pillows !!!! Wow what a great idea- Charley Harpers designs are amazing and to see them come to life in 3D is incredible. The canvas would be amazing and Grainline Studios just released Portside travel set (duffle bag) would look great sewn up in this. I’m so excited about these patterns by Charley Harper. I love the fall, earthy colors and the birds; so pretty and fun. The five yards would make a great fall tote, skirts and/or a pretty dress. I would be ready for such a love thanksgiving! My husband LOVES Charley Harper and so he would be super jazzed to have me sew him something (we are working on him loving me-made!). These are all too cute! With the NY weather finally getting into the Fall / Wintery skies I adore, I’ve been thinking about making jammies and retro dresses with fabric accessories! All of these prints would be perfect for those, the organic cotton making me happy inside. Makes it even better that the come in different weights and textures! Having such gorgeous prints in knit fabric is a real treat and I would love a wrap dress in one of these . Thanks for a fab giveaway! Fantastic! I’ve always loved his designs and those fabrics would make a really great quilt. Fingers crossed! I’m super excited for such cute organic knits!!! I think 5 yards would make an amazing dress! I’m excited cos the prints are lovely-I have not had much luck with finding knits that have cute prints, so obviously I’d make a bunch of knit garments with my winnings! Charley Harper’s designs are timeless. They have a retro feel but are also incredibly fresh and current. The colors are fantastic! With 5 yards, I would LOVE to do some curtains for my small Mid-Century home – the patterns would fit perfectly! I’m so excited for the flannels! They would make amazing pajamas and tunics, which is exactly what I would do with 5 yards. 1. I love making clothes for children in vibrant colors. It doesnt get more vibrant then this! 2. We have 4 new babies arriving in our family from christmas until january, and I would love making something for them in knit or flannel! Shoot. Why am I excited? Who wouldn’t be about finding repro prints that aren’t quilting fabrics for once? Now if I got my nimble little hands on that cardinal print that would be instantly become a wrap skirt. This collection is so exciting because Charley Harper artwork is so iconic, bold and colorful! It’s great to see his work displayed in quality organic fabrics to be loved in a whole new way. I have admired Charley Harper’s work since I first saw the 2002 International Migratory Bird Day poster. If I won the fabric the possibilities are endless: Tote bag, pillows, apron, hanging arrangements, and scrap fabric can be used in one of my quilts. Love the prints and classically retro feel of these. And omg in KNITS?! Amazing! With 5 yards I would finally make this one really great shirt waist vintage pattern I’ve been dying to make, full skirt and long sleeves. Here’s hoping!! I just ordered material for baby pants from Fabricworm and love it! Can’t wait to see more and the Harper prints looks great. I think I’d treat myself to a dress. Totally love his designs, they match any style! I’d use the fabrics for a special collection of my handmade handbags :) Thanks for this opportunity to win these yummilicious fabrics! Top of the page — Fabricwom (I know you mean Fabric worm). It’s also typoed on the FB post. I don’t know what I would make with 5 yards but I sure would love to have the opportunity to figure it out. I’m in need of a new diaper bag and these canvas prints have really caught my eye. Thinking lucky thoughts! The fabrics are so pretty! I would make myself a funky winter dress to warm up the Montreal winter. I have admired Charley Harper’s work since beginning my work as a wildlife biologist in the 90’s. I would try to use every inch of that fabric to decorate my baby’s nursery. Any excess would go to complimentary work in the living room! This collection is so great because it has something for everyone in my family. Kid-friendly, but not too cute for my growing boy. I’d probably sew something for myself to wear and something for the kiddos too. I think the leaves are my favorite pattern. oh wow, those prints are fabulous! And to be able to get them in a variety of textiles is fantastic. I could do a lot with 5 yards — I have two girls who would love new jammies and I would love a new blouse. thanks for the chance! Oh, these prints are fantastic! I love that this line is using organic cotton. That is so important to me! I especially love the fat little cardinal birds. I think with 5 yards, I’d sew a comforter (and a couple of pillows?) for my 7-year old son! I would make a dress, of course! Love charley Harper! I’m a Charlie Harper enthusiast. I’m always looking for CH vintage things and get very excited about seeing his designs used in new ways. I would definitely make something for one of my kids, not sure what. Maybe just make some animal patches to put on some plain shirts. I would likely make myself a bag out of one, or maybe a new knitting needle case, something that would last a long time but I would get to use a lot. I love the vibrancy of the fabrics. I’d plan on making a quilt if I won the giveaway! I love the prints – they are all beautiful! Fabrics are what inspire me to sew so having such a wonderful assortment could lead to some awesome creations! I love it because it’s just GORGEOUS! The colors are fabulous together and the prints are amazing. With 5 yards…..I would make myself a dress and try to make my kids some shirts and my husband a tie for pictures….or a blanket (I would love those on my bed!). They are just gorgeous! What a gorgeous collection – I love Charley Harper designs! With 5 yards I would make a 50s style sheath and a coat with a matching lining! Woah! Charlie Harper is totally one of the only things where my whimsical tastes and boyfriends midcentury modern sensibilities can agree on! I would really love a birdie knit winter dress (maybe even with the laurel pattern) and lots of purlbee style flannel lap duvets. I live these fun flirty beautiful fabrics! We don’t have anything like this where we live. I make fun purses for friends and family so I would use the fabrics for gifts. I love the birds on the fabric, and it’s Birch Fabric, no need to say more. With 5 yards I’d probably make a quilt, though I’d be tempted to do a skirt and bag too. I’ve never heard of Charley Harper before, but I’m already smitten two minutes into knowing about this partnership!! If I won 5 yards I’d have to sit it nicely on my cutting table for a couple of weeks to admire/stroke it before I could bear to cut into it! Then when I did I’d have to make something so mind blowingly awesome I’d have to keep pausing to stroke it some more. I’d probably make myself a travel set, dress bag, overnight bag, toiletries bag etc! 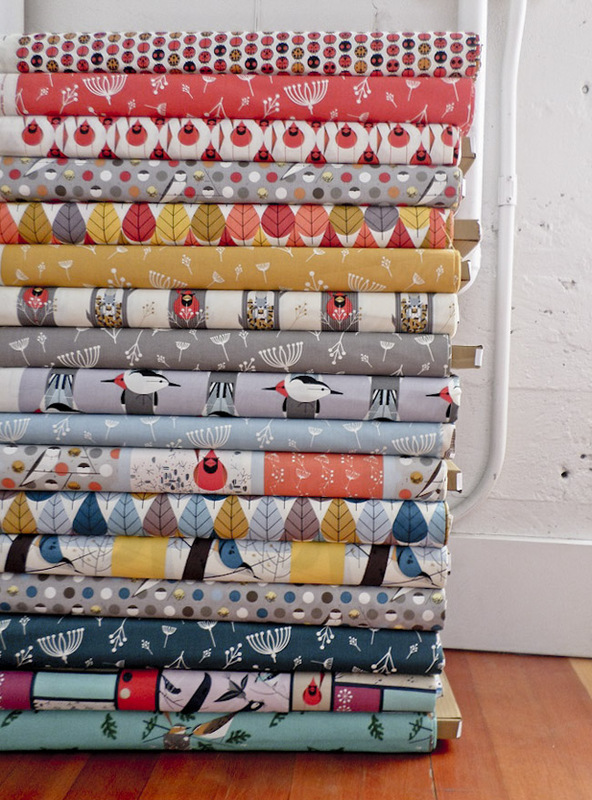 The Birch Fabrics’ Charley Harper collection looks so pretty! Maybe it will even convince me to step away from the solids for myself and join my kids with fun prints. With 5 yards I could see making myself and my daughter our first mommy me dresses and maybe even a vest for my little boy depending on the dress patterns chosen! I like the simple understated prints. Since I’ve been trying to incorporate more prints into my wardrobe, I’d make some print tops to wear under cardigans. Must check the website! MUST! I love Charley Harper’s prints because I can add a dark neutral for a more mature piece or a great bright piece of fabric for a youthful flair. I would make matching aprons for my daughter and I using the technique above. Reds and navys for me and bright pinks for my daughter. We just moved and I am revamping our living room decor. I love these prints and several of them fit perfectly with my design ideas for our front room. If I won five yards I would make new throw pillow covers and valances for the windows. Even if I don’t win, I’ll be hunting down a half yard of those meadowlarks on the teal background for an accent pillow! I love that it comes in knots! Dresses for my daughter and shirts for my niece!! I always have loved birch fabric’s fabulous designs, so I am quite excited about their new partnership with Charley Harper. 5 yards of cardinal poplin would make a lovely Crepe! Love Birch fabric because the prints are perfect for any project for anyone. They have fantastic color and print combinations. If I had 5 yards, I would be the happiest girl in the world and would annoy my husband by sewing up matching pj bottoms for us all!! I love those ladybugs! I might make a pair of curtains from them. I love the color schemes and designs. It is always warm here in FL and can see some fun shirts and casual wear. Mmmm, I think I would make some pillows and stuffed animals out of the flannel. Love the new fabric–can picture them in an amazing quilted wall hanging! I love these! If I won 5 yards, I think these would be perfect for leggings-and-tunic outfits for my daughter and myself. Wow this fabric wasn’t on my radar due to a fabric diet. Now I’m smitten! 5 yards of canvas would certainly help me with my drafty bathroom. I’d either adhere it directly to the walls or staple to canvas frames for art-worthy wall hangings! The knits are super dreamy though! I’d make a knit Macaron for me plus some fun dress or romper for my pre-schooler! I looove Fabric Worm! 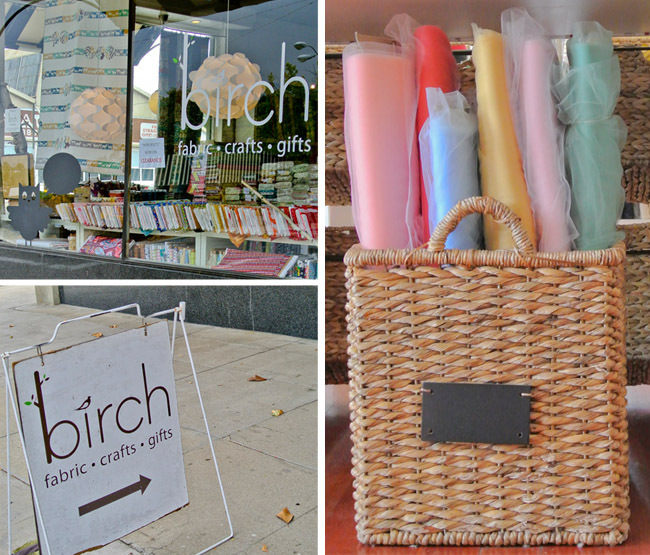 Thanks for introducing us to Birch Fabrics! So adorable! I would definitely use these to make my next quilt. I’ve had my eye on Charley Harper for a while now. The whole collection is gorgeous. What would I make with the 5 yards? Definitely a dress or some tops and clutch purses to add to my goal of sewing my 2014 Spring/Summer wardrobe. I’m excited because I really enjoy the beautiful blue print that has birds& leaves. It reminds me of my grandmother who taught me to sew many moons ago& with 5 yards I will most certainly create a clothing item for one of my children. I am planning a pretty winter dress & these cool tones would look very nice for it. My sister has always loved Charley Harper. Her birthday is in December, so if I won 5 yards I’d make something for her (bag or tank top?) and give her the rest to create something herself! Charley Harper mixes nature and art so wonderfully! I’m a huge fan of his work. And his work on fabric???! – so darn exciting! What WOULDN’T I make with 5 yards of this fabric. A button up shirt for my son, a skirt for my 9 year old, a dress for my 3 year old, a skirt for me using my new Zinia pattern. The designs and colors are so sweet in this collection, and I always love organic options! I just purchased the Peony dress pattern, so I think I would make one of those and use the extra for some pajama pants and fun little extra projects. Lovely! I love the prints! I would definitely make a dress! I absolutely ADORE Charlie Harper. Paired with Birch Fabrics makes for a match made in heaven! With 5 yards, I would definitely make a quilt/blanket for my little guy. The designs are so clean and refreshing! With five yards, I would sew a dress from that cute cardinal print knit fabric and a ton of bags and storage baskets! I love the Birch fabrics I’ve worked with so far, and the bright colours and nature theme of the Charley Harper collection is right up my alley. 5 yards is a perfect amount to sew myself a dress. or make some floor cushions. I was at Quilt Market last week and fell in love with the Charley Harper stool that Birch had in their booth. Then, I fell in love with the rest of the line! 5 yards would give me enough to make something cute for my nephew for Christmas (maybe a tiny sleeping bag) and a shirt or skirt for me. I love all of the designs, I think I would have to make my little boy his first pillow case and duvet cover set. He’s still in a sleep bag and I would love to make his first set of bedding for him. He’d be all snuggly and warm in a beautiful soft bed, he keeps stealing my pillow in the mornings bless him. What gorgeous fabrics! My buds & I get together for an annual knitting retreat, so I’d definitely make us matching bags with the yardage. Or, I’d go for the flannel & get some extra to make us matching jammie bottoms, as I’ve wanted to do for ages. The colors in this collection are great, I especially like the twigs. I would probably start with a dress and maybe make a bag or something for my kids with the rest. Thanks for the giveaway! I love, love Charley Harper. I would use the fabric for my daughter — she’s one, so I could fit a lot of little kid clothes into five yards! Maybe a dress, some pajama pants, and a darling jacket lining.